Jenn and Romy: Our First Earthquake! USGS's 'Did You Feel It?' shaking intensity map. We've been living in California for just over 3 years, and it was only last night that we finally felt our first earthquake! It wasn't anything crazy, but it did shake the house a little. The shaking started just before midnight. I was sitting on a chair in the living room reading the newspaper, when it sounded (and felt) like a huge truck was going by on the road. At first I didn't think anything of it. But then it started to get very choppy and uneven in the shaking, and began to get stronger. It was very weak shaking, because nothing fell over, but I heard the walls shifting and the art wall panels hitting the wall as they were slightly jostled. If I was sleeping, I don't think it would of woke me up. I think the sound of the walls shifting and the panel jostling made the shaking seem more intense than it really was. It only lasted 3 seconds or so. Five minutes later, there was a small aftershock which I didn't feel, but I saw posted on the USGS website. 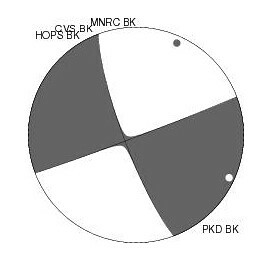 The beach-ball diagram of the earthquake. 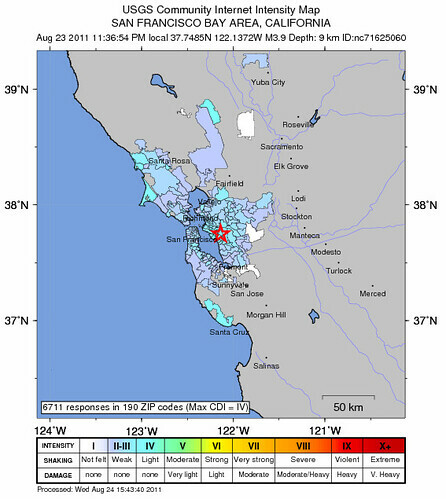 The USGS report said it was a magnitude 3.6, and the epicenter was just south of Oakland, at a depth of 9.1 km. I think it was on the Hayward Fault, which is the major fault that runs along the East Bay, less than one mile away from where we live!!!!! Also on the USGS's website, you can report the intensity of shaking that you felt on their 'Did You Feel It?' webpage. You report what you felt, and they organize it by zipcode. Then they post the results live, as people in the area go online and report in. It looks like most people who reported in thought the shaking was weak to light, intensity III - IV. I reported in an intensity III last night. Its kind of funny to see some really excited people who report high shaking intensities, higher than the vast majority of the people who live really close to the epicenter.